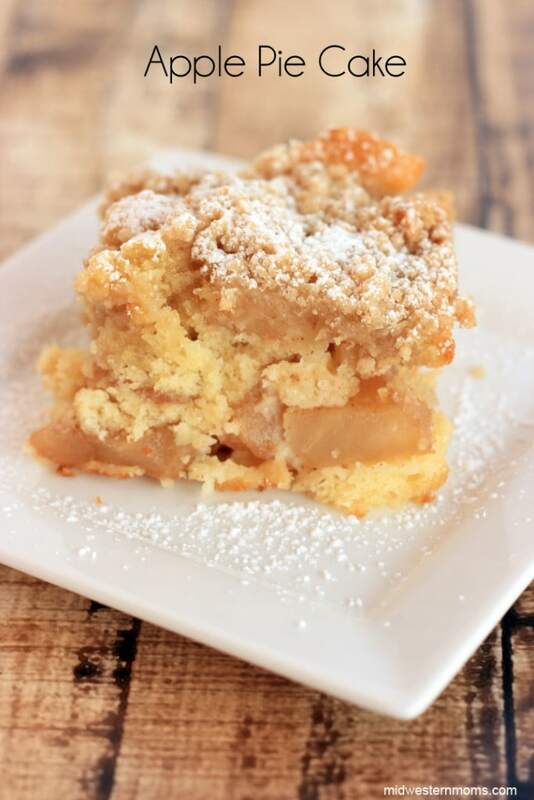 My favorite part about this Apply Pie Cake is the crumble topping mixed with the softness of the cake. 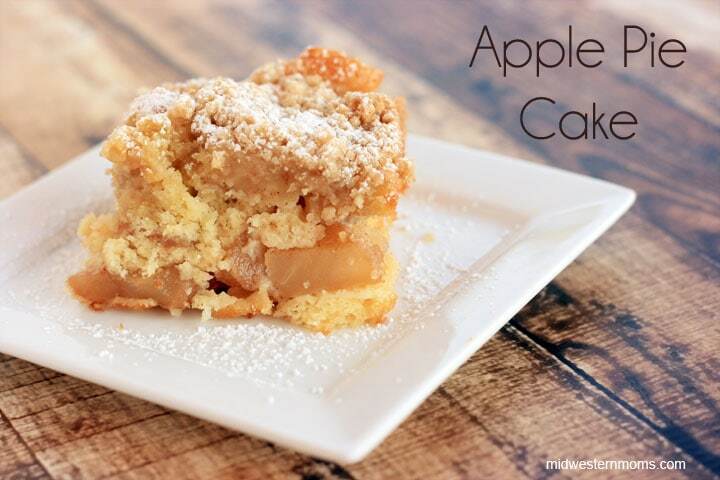 Tied together with delicious apple slices makes it a blend of pie and cake. This apple pie cake recipe turned out to be pretty tasty. It is the best of both worlds, pie, and cake together! I think my favorite part is the topping. 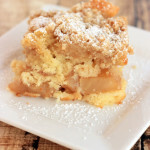 I love the crumble topping with the softness of the cake. I also like to top this delicious dessert with a little bit of powdered sugar. The perfect blend of pie and cake to make a delicious treat! In a medium bowl, stir together the brown sugar, flour, and salt. With a fork, work in the butter till crumbled. Set aside. In a large bowl, mix apples with brown sugar, cinnamon, and lemon juice. Set aside. In a large bowl, beat the cake mix, water, oil, and eggs together on low for about 30 seconds. Then mix on medium speed for about 2 minutes. In a 13×9 greased pan, pour the cake batter. Then layer in the apples on top of the cake batter. Then sprinkle the topping over the apples. Bake for about 30 minutes at 350 degrees. You will know it is done when a toothpick is inserted into the cake and it comes out clean. Looks scrumptious. Thanks for sharing on the #HomeMattersParty this week. I hope you join us next week. I hope that nasty cough leaves soon! This cake looks like a perfect apology! YUM! I love apple pie. Was just thinking of making an applesauce cake soon but maybe I’ll make this instead! What kind of apples did you use?? I think I used Pink Lady Apples. Going to make this to take to my family reunion, hope they like it, we’ll let you know. Thanks for the recipe love anything with apples ! I bet they will Love it! We did! Was wondering if anyone has to increase the baking time on this cake? 30 minutes wasn’t long enough. I’ve had mine in for almost an hour before it was done. Interesting Mel. Maybe difference in ovens or elevation may have something to do with this. I’m making this right now and I’m up to 45 minutes baking time. I wondered if anyone else had this issue. Can you use Apple pie filling from a can ? You probably could, however, I have not made it pie filling. This is the second time I’m doing this and I have the same issue. 350 for 30 mins is not at all enough. Seems more like it needs to be 375 for about 45 mins. I love the taste after I try several time to leave it in longer and it’s finalky cooked.